What brought you to SJU? Do you remember why you declared an IR minor? I toured many schools but felt SJU had a strong sense of community, a great student to faculty ratio, and a lot of excellent classes. When I walked on campus I could see myself living in the dorms and having a great four years. I know I made the right choice. I already had love history and political science. Speaking with Dr. Fukuoka and taking his class was a driving factor in my decision to declare this minor. I was a Hawk Host for 3.5 years. I enjoyed interacting with prospective students and their parents as well as presenting and giving tours of the school. My junior year I studied abroad in Leuven, Belgium, through the Belgium Internship Program. I worked at the European Parliament and reported on committee hearings to provide background and insight for József Szájer, the Hungarian vice chair of the European People’s Party. During these hearings, I would often wear headphones and get real-time translations of the speaker who was talking. I also researched policy issues, including transatlantic trade and foreign policy. This internship was one the high points of my time at SJU. It gave me the professional experience I needed which helped launch my career. I would suggest this program to anyone interested in international relations and political science. Charles standing in front of the entrance to the European Parliament in Brussels during his time as an intern for József Szájer. 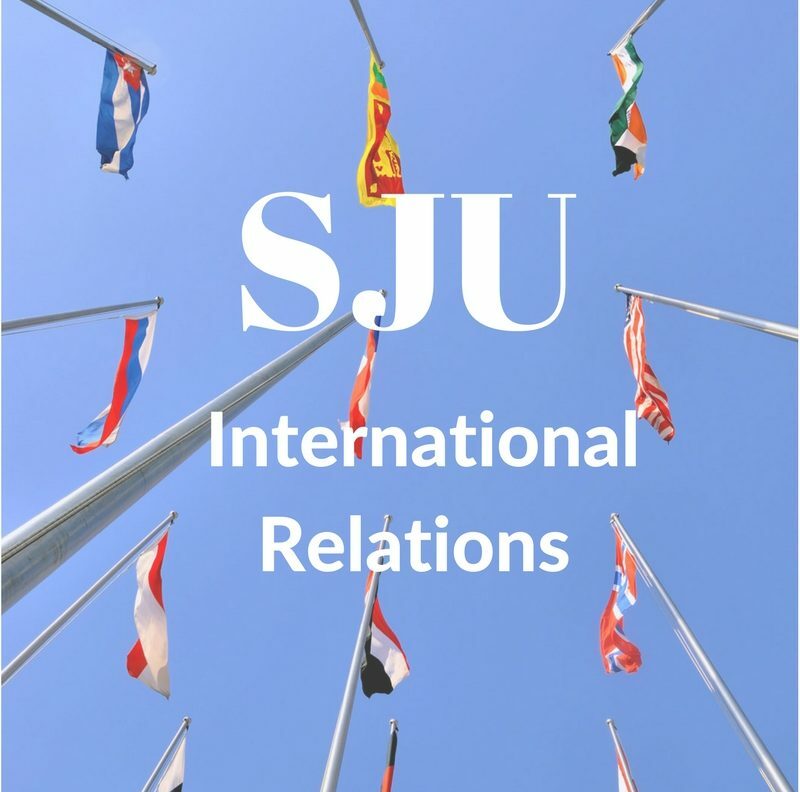 How did your experience at SJU, both generally and in the IR/HIS department, shape your career path? Right now, I am about to complete an eight-month internship in Counter-Terrorism Research at the Institute for the Study of War. I gather and produce daily intelligence reports on ISIS activities in the West (Europe, USA, Canada, and Australia). I maintain the archival database for my areas and assist the lead intelligence planner with publications. The research and writing I did in my courses at SJU helped prepare me for my job. I use those skills in my work every day. If there is an incident in a particular country, I look back at the history of ISIS activity in that region to see if this latest event is part of a larger pattern. I also learned a lot about how foreign countries’ governments function in my classes at SJU and this knowledge is key to helping gauge what actions the different governments may take in response to an incident. IR is special at SJU because of the individual attention the faculty give their students. The number of events the IR department hosted furthered my education in International Relations. I attended an IR event in October 2016 where a small number of students met with two current U.S. Ambassadors from Brunei and Vietnam. It was extremely informative and the students were able to ask questions and get a better sense of what it is like to work in international relations at the State Department. I would advise students to get as much experience in college through internships and other complementary experiences. Attend the many events that History, Political Science, and IR departments offer. All of this will add to your experience and better help you understand the world. I would suggest that students continue taking a language at SJU. This will help you be competitive and it adds to your educational credentials, too. This is often experience some employers are looking for as well. Do you have any advice for graduating seniors? Right now students should be taking advantage of all the Career Center has to offer. This is a great resource that SJU has for it’s students. Go to the Career Center’s job fairs and practice talking to potential employers. The Career Center can also help with your resume and conduct practice interviews. The Career Center also posts jobs online which students should check. Also, get networking. Get in touch with family and friends that had jobs in the fields you want to apply to. Find networking events to meet new people that can lead to potential job. Get in touch with SJU alumni, too. There are a lot of SJU alumni working in D.C. Lastly, do your research about companies before an interview. Know the mission of the company, a brief history, and any recent publications they produced. Lastly, keep applying. Being rejected from a job or not hearing back is just part of the job search process. Ultimately, I want to serve my country in civilian or military intelligence.